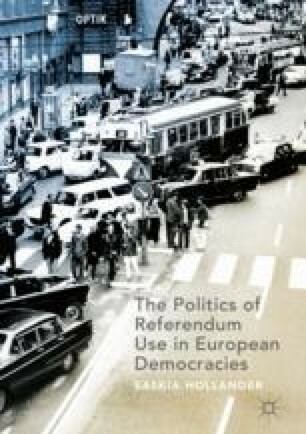 This chapter covers the analysis of referendum practice in the UK – a majoritarian democracy where three (UK-wide) referendums were held between 1950 and 2017. After providing an outline of available referendum provisions and referendums held, this chapter analyzes British referendum practice on the basis of this study’s six independent variables. It shows that the long prevalence of two-party competition between Labour and the Conservatives had enabled situations in which both consistently called for referendums on ‘Europe’ when in opposition, as a way to strengthen its position vis-à-vis the ruling majority, but were able to withdraw such calls once in office. Yet, the recent fragmentation of the political landscape in the UK has made the withdrawal of referendum calls more difficult – the Brexit-referendum being exemplary for this argument. Gay, O., and L. Horton. 2011. Thresholds in Referendums. House of Commons Standard Note SN/PC/02809. http://researchbriefings.files.parliament.uk/documents/SN02809/SN02809.pdf. Accessed 20 June 2015. Miller, V. 2008. EU Treaty Bills: The Whip and Referendum Clauses. House of Commons Standard Note SN/IA/4650, 1–6, January 22. files.parliament.uk/documents/SN04650/SN04650.pdf. Accessed 10 Sept 2015. ———. 2009. The Treaty of Lisbon: Government and Parliamentary Views on a Referendum. House of Commons Standard Note SN/IA/5071, 1–23, May 15. researchbriefings.files.parliament.uk/documents/SN05071/SN05071.pdf. Accessed 10 Sept 2015. ———. 2013. Leaving the EU. House of Commons Research Paper 13/42, 1–106, July 1. www.parliament.uk/briefing-papers/RP13-42.pdf. Accessed 18 Dec 2015.